Having obtained a reasonably reliable 10MHz lab reference (see here) I decided to calibrate my Frequency Counter only to find that the stock oscillator provided in the HP 53151A is absolutely terrible – a joke even! 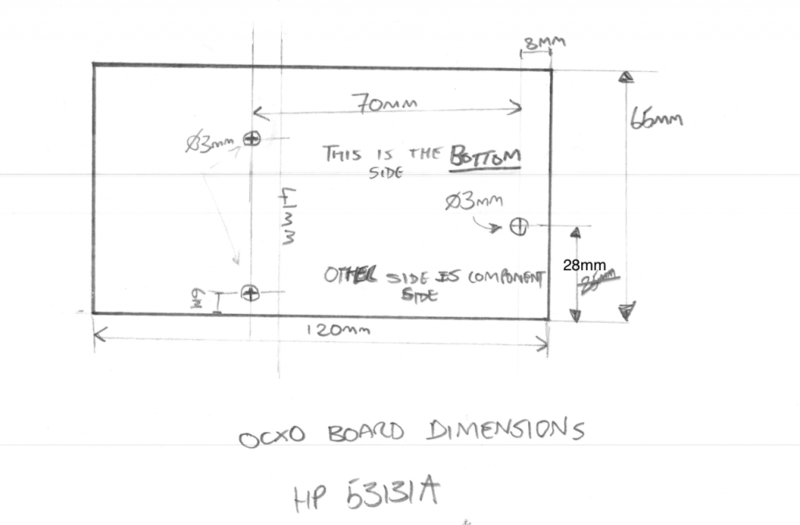 I looked around for an “010 High Stability Timebase Option” but they are rare — and if you can find one not installed in a counter they are very expensive – in the few hundred dollars range at least — and buying one from HP is, well, expensive in the extreme. 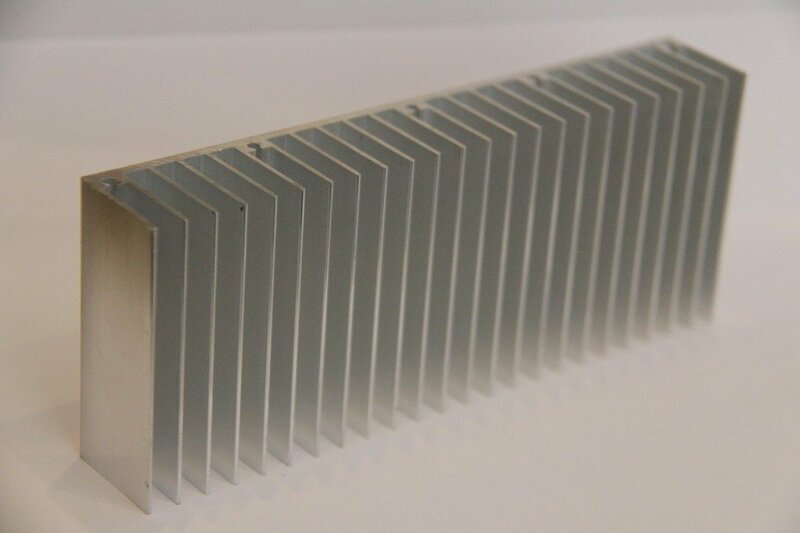 There are many second-hand 10MHz OCXO modules available, these are mostly stripped from old telecommunications, satellite or cellular equipment so they are plentiful and relatively cheap to buy too. I decided to make a clone 010 option board for my counter using a second-hand OCXO bought from e-bay. I designed a PCB to get a professional finish as well as a reliable upgrade for my counter. The main goal was to make an option board that just like the original could be automatically calibrated using the internal software and front panel controls so I had to use the same DAC chip (which is now obsolete) and basic topology of the original option board to make it work. 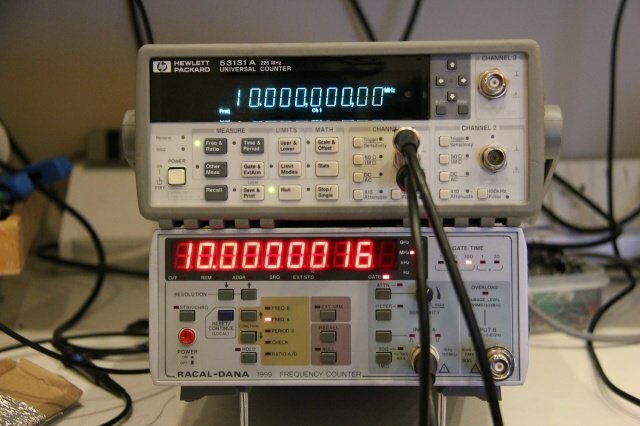 The result speaks for its self – with the OCXO running as the timebase, the counter is able to measure the 10MHz source it was calibrated with to a precision of 100th of one cycle with no error! The schematic is pretty simple and self-explainatory. 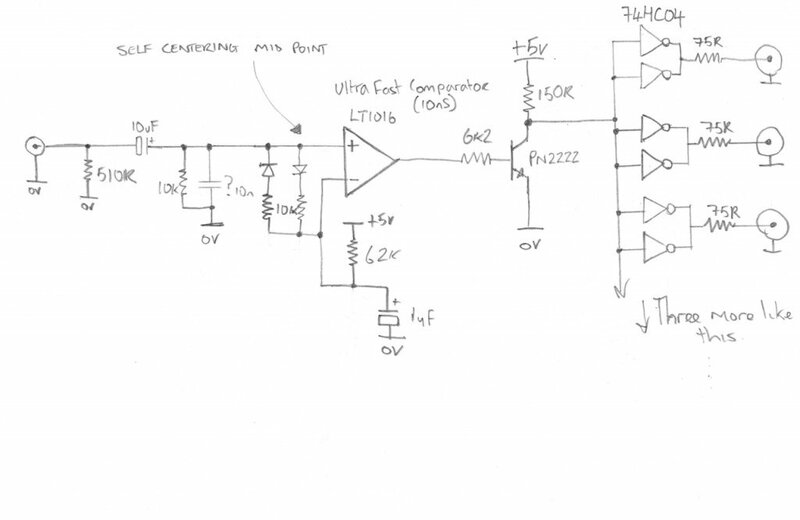 The counter seems to need a differential square wave clock drive, this is created using a high-speed differential output comparator part LM361. 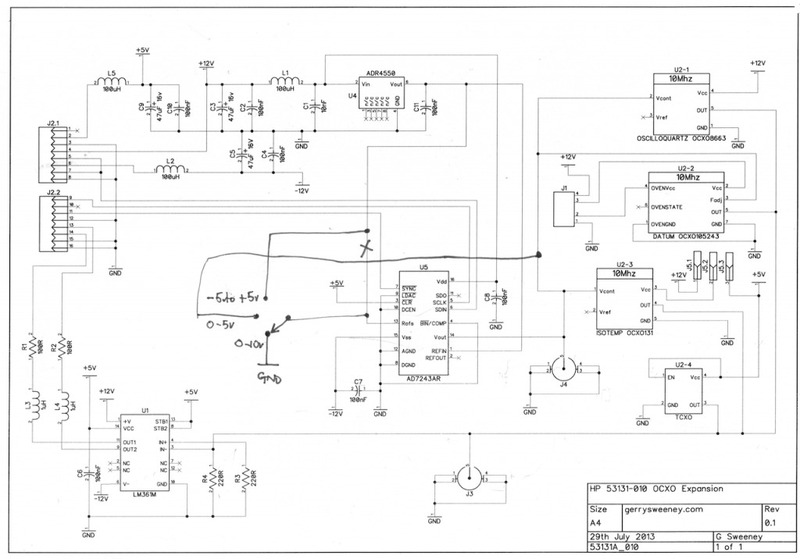 The DAC is an AD7243 part from Analog Devices, this part is now obsolete and not recommended for new designs but they are still available from various sources, albeit quite expensive parts. 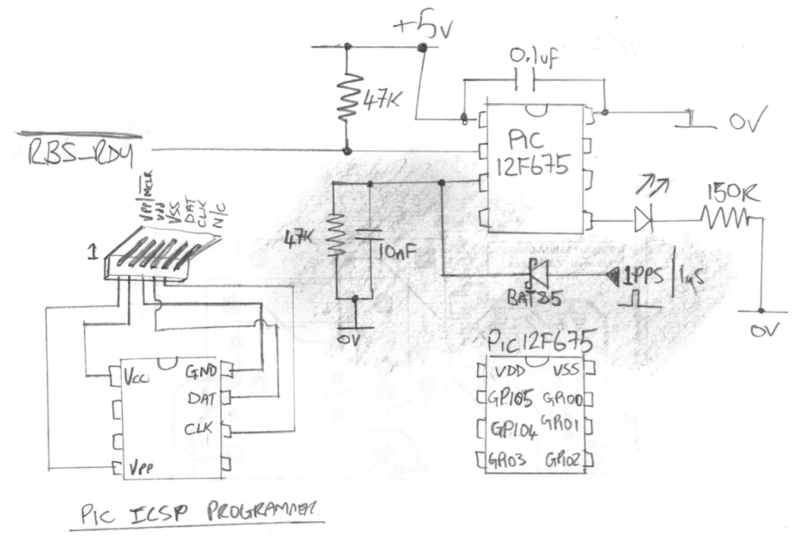 It would have been possible to design in a newer part but for the small number of units I wanted to make, it seemed a bit pointless to go to the effort as the recommended newer part actually requires different serial signaling, and this would have required some kind of serial protocol converter microcontroller. The DAC is driven by the counters microprocessor to calibrate and tune the timebase. The ADR4550 provides a high stability 5V reference for the ADC. The rest of the circuitry is basically power supply and signal filtering. 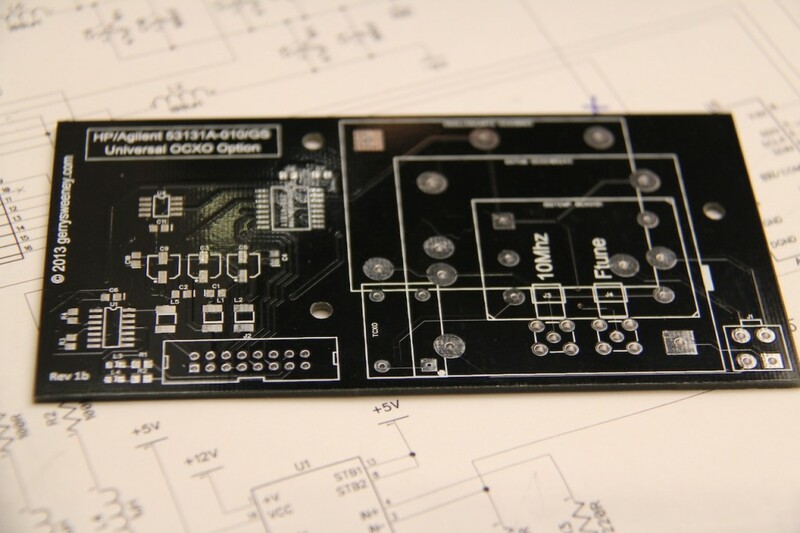 The PCB layout was designed to accommodate different OCXO footprints making it flexible. As well as supporting OCXO’s there are footprints for SMA connectors and you can even use a low-cost TCXO which cannot be automatically calibrated but is still a considerably better option than the oscillator built into the counter. The finished board fits really neatly inside the counter, and even fits around my previous Hard Power Switch Modification project. As a follow-up to a previous blog post where I created a seven decade programmable resistor substation for use during electronic circuit prototyping and development, I thought I would expand on the concept and develop a decade capacitor solution to complement the decade resistor board. This new board is a five decade programmable capacitance and is in exactly the same form factor as the previous resistor project. 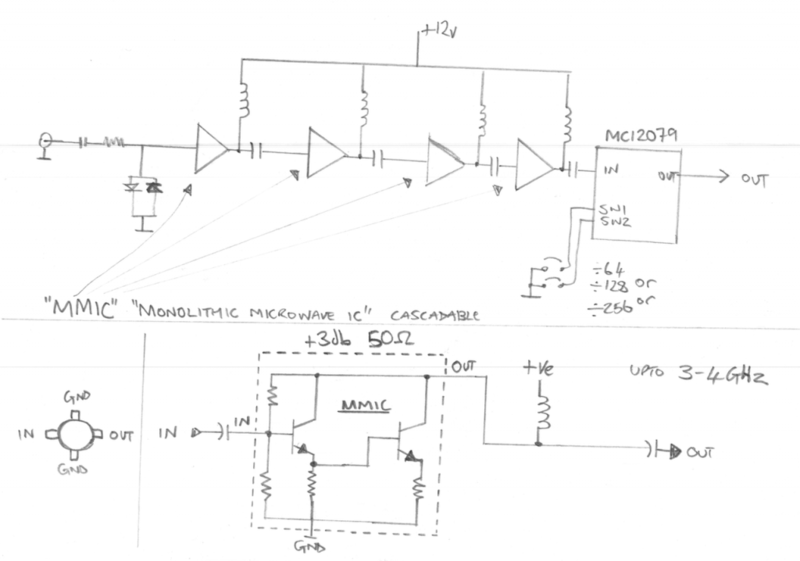 The capacitance can be programmed in the range of 100pF through 9.9999uF in 1000pF increments. The tolerance of the capacitance is five (5%) percent. My goal was to keep costs down while making the board usable and functional and reliable so I continued to use the 0.1″ jumpers I had used for the resistor board. However, to achieve a programmable capacitance you need to use small capacitors and parallel them to obtain the desired value, and the challenge here was how to achieve that with jumpers. In the end I took the simple approach and provided 10 jumpers for each decade, but instead of a two-pin header row I used a three pin header row so each of the 10 jumpers has an “on” (1) or “off” (0) position. I concede that the board is slightly more difficult to use than the resistor board, and thats simply because of the number of jumpers – dialling in a value involves moving multiple jumpers per decade. However, with the cost to use high quality switches I felt that the infrequent nature of use for the board, it was a reasonable compromise both in terms of design theme consistency and cost. 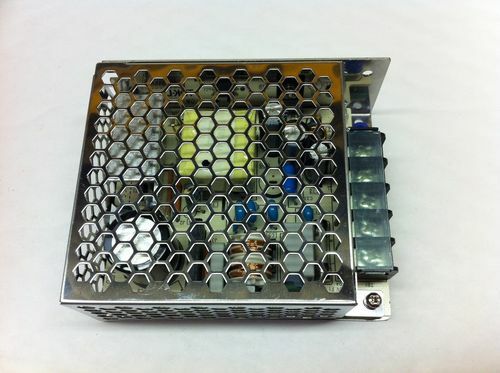 When working on linear circuits, in particular around op amps, PSU’s and other circuitry that needs response tuning, having a decade capacitance to hand when prototyping is a very valuable tool – not for day to day use of course, but when you are doing that specific job that needs this, its worth its weight in gold. If you are interested in one of these boards I have had a bunch of them made and am selling them. You can buy them on http://tindie.com or if you prefer on e-bay – simply search for “gerrysweeney” on either system to find the items. This is a follow-up to my previous article here. When testing the 1 PPS output I found some strange output which needed further investigation. I also decided to make further use of the microcontroller and status LED to indicate the 1 PPS signal to provide a degree of visual confidence that the frequency standard was working. Here is the outline schematic of the digital channel of the video amp that is now used for the 1 PPS signal. When I first tried to implement this I used (or tried to use) the edge trigger interrupt capability which on the face of it should have been the perfect solution. However, no matter what I tried I could not get it to work, the best I managed to achieve was getting it to work some of the time, but it was very random. I suspect this was down to the way in which the PIC12X handles interrupts and context state saving implemented by the compiler, I read somewhere on the microchip forums that this issue *could* be resolved by upgrading to the PRO version of the compiler…..hmmmmmmm. Anyway, I decided to change tact and poll for the 1PPS signal which meant I also had to construct a really simple pulse stretcher circuit to ensure I was able to catch each pulse. Not as elegant as an interrupt-driven solution but it works. I think the more advanced PIC18Fxxx series micro controllers would have worked using interrupts but those are big chips and I was already committed to the PIC12F675. Here is the schematic for the micro controller which now also monitors the 1 PPS output of the RBS. The shaded area is what has been added to the circuit since the previous article. Here is the firmware source code with the 1PPS implementation added. Its implemented as a simple state machine in run mode, I have tried to keep the code simple to read. // This is when we are in run mode. // count 0-1-2-0-1-2...etc LED on for 0, and off 1 & 2. // about three blinks a second. And for those of you that just want to program the chip, here is the compiled HEX file.